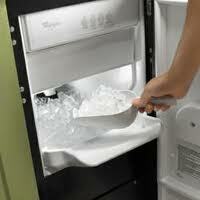 We repair all types of residential ice making systems. Ice makers inside the freezer, and under-the-counter ice machines. Ice making in it’s simplest form involves water and very cold temperatures. 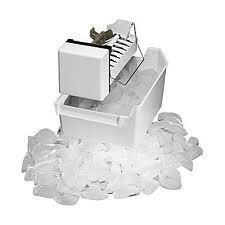 Fortunately we have come a long way from empty ice cube trays in the freezer! Ice makers operate on five basic principles. Fill, circulate, freeze, harvest, drain. Fill- Is there water available to make ice? Is there enough water in ice maker reservoir? Circulate- Does the circulation pump run after the fill. Water must run evenly and continuously over the frozen plate. Freeze- Does the frozen plate get frosty and is the frost pattern even? Harvest- Once the ice is formed, a sensor will send a signal to the control to go into defrost mode. At this point the frosty plate warms up, dropping the ice. Some machines harvest cubes directly, others harvest ice sheets, which are then cut into cubes on a grid cutter. Drain- Ice machines use a lot of water. It is necessary that there be an adequate drain system available and that the drain be operating freely. Water backing up melts ice.